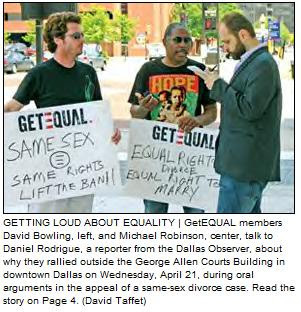 Stonewall Gazette: Texas court hears arguments in gay divorce case; only 2 gay demonstrators show up! Texas court hears arguments in gay divorce case; only 2 gay demonstrators show up! "Michael Robinson of GetEQUAL, said he was disappointed that more people from the LGBT community didn’t show up."